Transcontinental Interstate 10 has 12 active business loops and several decommissioned business routes. The freeway replaced U.S. 290 west of Harper, Texas, U.S. 190 west of Iraan, Texas and U.S. 80 between Interstate 20 in West Texas and Interstate 8 at Casa Grande. The freeway west from Phoenix, Arizona to Santa Monica, California also displaced portions of U.S. 60, U.S. 66, U.S. 70 and U.S. 99. Most of the remaining I-10 business routes represents old alignments of those U.S. routes. 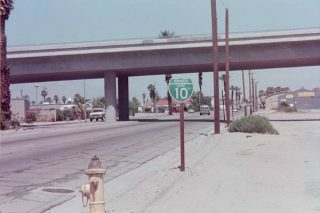 This was formerly Business U.S. 70-99 and was signed as Business Loop I-10 in the 1960s along Holt Boulevard. The loop begins at the Kellogg Interchange, the junction of Interstate 10, California 57 (and former I-210) and California 71. Following Exit 42B to southbound California 71, the business route joined Holt Avenue from Exit 14A across Pomona to Holt Boulevard and the city of Ontario. Shields still remained along this route in 2001, but only within the city of Pomona and not on the I-10 or SR 71 freeway mainlines, per correspondence with Ali Pezeshkpour on May 1. The remainder of the route extended along Holt Boulevard from the city of Montclair to a wye interchange (Exit 55A) with I-10 just north of Ontario International Airport (ONT). This business route began east of Interstate 15 and followed Valley Boulevard (former U.S. 70-99) through Colton between Exit 59 (Etiwanda Avenue / Valley Boulevard / Commerce Drive) and Exit 71 (Mount Vernon Avenue). This business loop was not listed in the 1991 state signing log. Despite that, at least one sign for the route remained in place along Valley Boulevard as verified by Cameron Kaiser in 2006. Beginning at Exit 139 and returning to Interstate 10 at Exit 146 via Dillon Road, this business route followed Indio Boulevard along former U.S. 60-70-99. Between 2006 and 2008, the remaining business loop shields were removed, leaving just Historic U.S. 99 markers posted along the route. The western part of the loop is maintained by the city of Indio, the middle segment is controlled by the state as part of SR 111, and the eastern section is maintained by the city of Coachella. Interstate 10 and Indio overcrossing near Indio via Indio Boulevard and State Route 86 to Interstate 10 and Dillon Road. The former business route includes a well-preserved section of old U.S. 99 through Indio as it parallels a railroad. This business loop is not listed in the 1991 state signing log, but it is well signed. The business loop begins at Exit 236 opposite California 78 on Neighbors Boulevard. 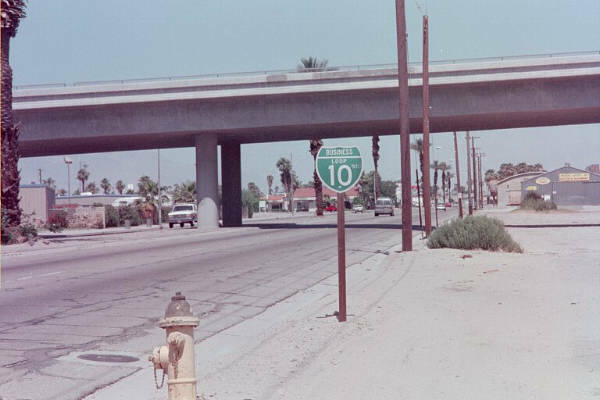 The route dog legs north from there to parallel I-10 along Hobsonway (old U.S. 60 & 70) east to Downtown Blythe. Business Loop I-10 returns to Interstate 10 near the Colorado River at the Riviera Drive interchange (Exit 243). The eastbound routing utilizes a turnaround to Donlon Street to rejoin I-10 east into Arizona. A 3.2 mile long loop between Exits 17 and 19, Business Loop I-10 at Quartzsite travels along Main Street (old U.S. 60-70). The business route also connects I-10 with U.S. 95 north and Arizona 95 south in addition to providing traveler services. There is no direct interchange between the two routes otherwise. 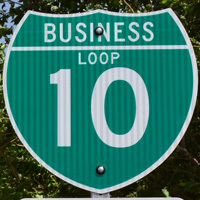 Business Loop I-10 references are limited to blue service signs from the Interstate 10 mainline. Business Loop I-10 through Phoenix used to follow Van Buren Street and the Arizona 143 Freeway. It was in place while the Papago Freeway section of I-10 was under construction. Decommissioning took place by the early 1990s, perhaps after the Interstate 10 freeway opened to traffic on August 10, 1990. Alan Hamilton added that Business Loop I-10 was signed at the southbound Van Buren exit on I-17, on the eastbound exit at 27th Avenue on I-10, and with various reassurance markers through Phoenix. The route was not posted on the I-10 mainline at the east end with 44th Street. See his Wrong Way!! photo page for a scan showing button copy signage for Exit 200B off Interstate 17 that previously included Business Loop I-10. Former Business Loop I-10 used to follow Arizona 387 and Arizona 287 between Exits 185 and 194 through Casa Grande. Old Arizona 84 (Jimmie Kerr Boulevard) was not a part of this business route.The route was eliminated in the 2000s when sections of the business loop were removed from the state highway system and transferred to local maintenance. Since Arizona includes Interstate business routes within the state highway system, the turning over of the Casa Grande route led to its elimination. Former Business Loop I-10 through central Tucson was decommissioned from the state highway system at some point in the late 1990s. Prior to its elimination, shield assemblies posted for Business Loop I-10 alluded to U.S. 89, which was dropped south of Flagstaff in 1992. The business route zigzagged southeast from Exit 255 along Arizona 77 (West Miracle Mile) east, Oracle Road (old U.S. 80 & 89) south, Speedway Boulevard east and Stone Avenue south to Downtown Tuscon. A couplet separated traffic between South Stone and Sixth Avenues to 18th Street, where Sixth Avenue (old U.S. 89) switched to two way traffic en route to Interstate 10 at Exit 261. Business Loop I-10 ended opposite the southbound beginning of another decommissioned route, Business Loop I-19. Between Exits 262 and 267, this instance of Business Loop I-10 followed old U.S. 80 and the Tucson-Benson Highway through eastern Tucson. This route was not signed despite being state maintained and logged as an official business loop until 2007, when it was dropped from the state highway system and decertified as a business route. The Rand McNally Road Atlas showed this route as an actively signed business loop throughout the 1990s and into the early 2000s. Old U.S. 80, which was overlaid by Interstate 10 between Tucson and Benson, curved south to Douglas at Benson. 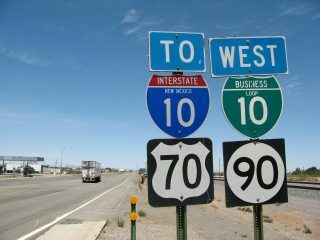 I-10 replaced old Arizona 86 east from Benson to the New Mexico State Line. The business loop in Benson was old U.S. 80 and old Arizona 86 between Exit 303 and Exit 306 via Fourth Street. According to the state highway log, there was a Business Spur I-10 from Interstate 10 at Exit 304 (Ocotillo Avenue in Benson) to Business Loop I-10. The interchange there was built in 1987. The business spur is not signed on the mainline, and there are no business spur signs present along Ocotillo Avenue as field verified in May 2003 and again in June 2008. The 2009 edition of the ADOT State Highway System Log route inventoried Ocotillo Avenue without a route designation. The 1998 edition previously listed the route as “SS010”, which appeared to mean “state spur” from Interstate 10. Extra thanks goes to Alan Hamilton for his assistance in locating this route. Business Loop I-10 in Willcox follows Haskell Avenue (old Arizona 86 and old U.S. 666) between Exits 336 and 344. U.S. 191, which replaced U.S. 666, follows the freeway rather than the business loop town. ADOT lists the route as 8.33 miles in length. The 4.53 mile route of Business Loop I-10 through Bowie overtook old Arizona 86 along Sixth Street between Exits 362 and 366. San Simon consists of a small street grid and a handful of services along old Arizona 86. A 4.06 mile long business route from I-10 travels along Sixth Street through the community between trumpet interchanges at Exits 378 and 382.
Business Loop I-10 in Lordsburg follows Old U.S. 80 (Motel Drive) from the Lordsburg West interchange (Exit 20B) to the Lordsburg East interchange (Exit 24). Motel Drive follows the Union Pacific railroad closely as it passes through Downtown Lordsburg. The rail line hosts service along the AMTRAK Sunset Limited. NMDOT inventories the Lordsburg business route as BL-21-P with a total length of 4.37 miles. 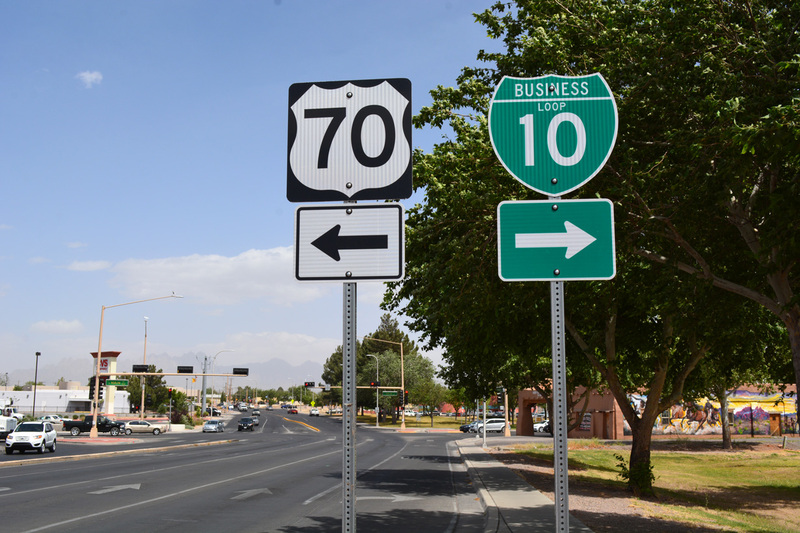 Consisting of a 4.46 mile loop, the I-10 Business Route through Deming follows old U.S. 70 and 80 along Pine Street east from Exit 81 to New Mexico 594. The loop returns to I-10 at a trumpet interchange (Exit 85) in east Deming. U.S. 180 overlaps with Business Loop I-10 (Pine Street) east from Gold Avenue and the Deming city center as part of a truck route. NMDOT lists the route as BL-22-P.
No longer inventoried in the NMDOT Posted Routes Legal Descriptions list, the Las Cruces business loop instead is included in the mileage of U.S. 70, NM 478 and NM 188. Remnant shields were posted along the route with at least one remaining as of August 2015.The Las Cruces business loop started at Exit 135 and ran concurrent with U.S. 70 (Picacho Avenue) east to Main Street south and Downtown. Beyond Downtown and the couplet of Water Street south and Church Street north, Main Street continues to New Mexico 188 (Valley Drive), which returned the loop to I-10 at Exit 142. The business loop was previously well signed from Valley Drive to the intersection with Alameda / El Paseo Drive, but not thereafter according to a report from Patrick Valdez. 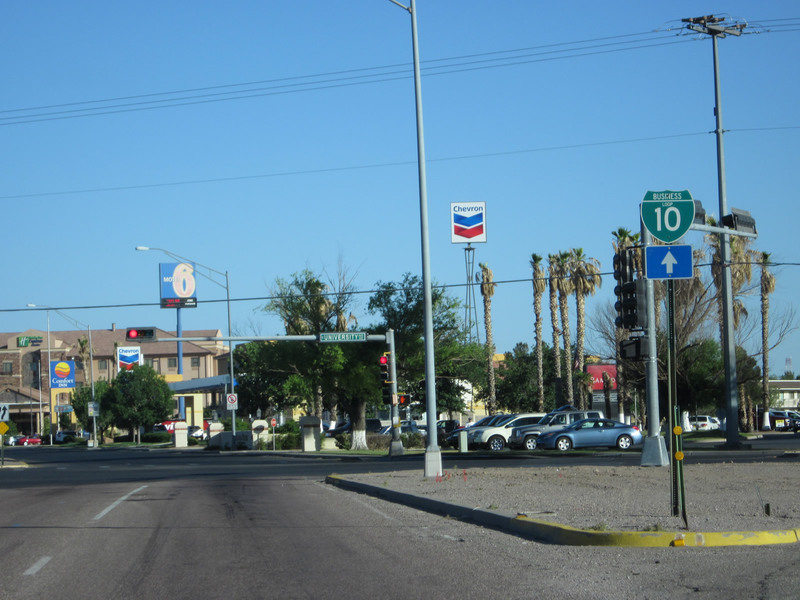 Furthermore as of October 2003, Business Loop I-10 shields were removed from Picacho Avenue, with the exception of the remaining eastbound assembly directing the business loop onto Main Street south. 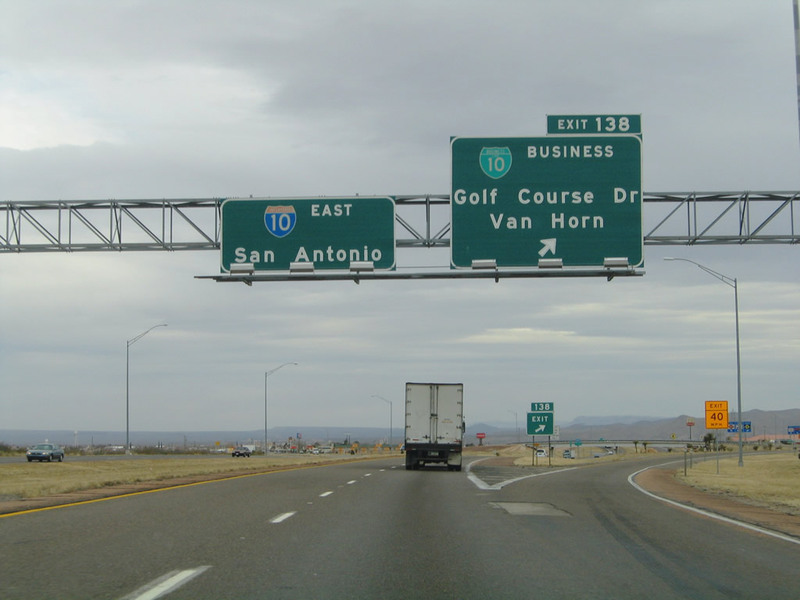 The Hudspeth County seat of Sierra Blanca represents the main service center for travelers along Interstate 10 between the El Paso metropolitan area and Van Horn. 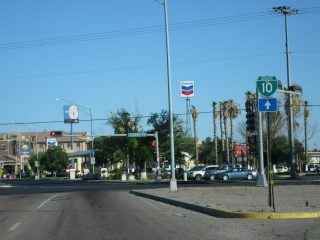 Business Loop I-10C travels for 2.7 miles along old U.S. 80 (El Paso Street) on the north side of I-10 between Exits 105 and 108 between split diamond interchanges at Exits 105 and 10). Sierra Blanca is notable for being close to a decommissioned sludge dump that used to accept tons of sewage from New York City until 2001.
Business Loop I-10D runs for 2.9 miles in Culberson County via old U.S. 80 by following Broadway Street between Exits 138 and 140B. Business Loop I-10F runs for 4.6 miles in Reeves County via Old U.S. 290. This route begins at Exit 206 and travels southeast along FM 2903 and northeast along SH 17 to return to Interstate 10 at Exit 209.
Business Loop I-10G runs for 4.4 miles in Pecos County between Exits 256 and 261 via Old U.S. 290 / Dickinson Boulevard through Fort Stockton. This is the last business loop for Interstate 10 eastbound, as remaining business loops consist of State Spurs, State Loops and sections of U.S. highway mainlines. Page updated August 31, 2016. The first westbound shield for Business Loop I-10 in Pomona, California. This assembly was still posted as of 2015. Photo taken 07/15/07. 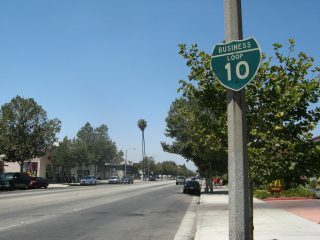 Reassurance marker for Business Loop I-10 west along Indio Boulevard at the Golf Center Parkway overpass in Indio, California. This assembly was replaced by 2006 and removed by 2011. Photo taken with Casey Cooper & Mike Ballard (1998). 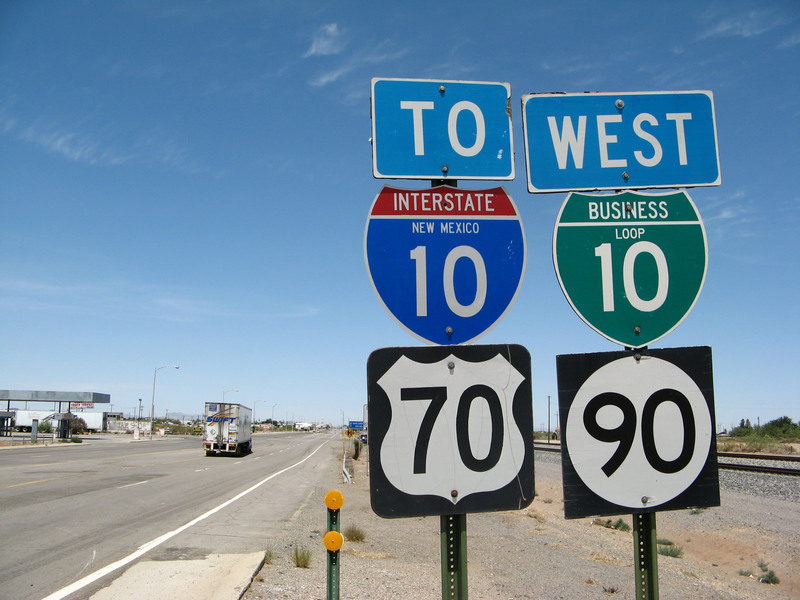 Westbound Business Loop I-10 follows Motel Drive through Lordsburg. It is cosigned with portions of U.S. 70 and New Mexico 90 along its route across the city. Photo taken 06/15/08. A remaining shield for Business Loop I-10 posted along Valley Drive (NM 188) north after I-10 in Las Cruces, New Mexico. Photo taken 04/28/12. Former button copy signs posted at the eastbound off-ramp for Business Loop I-10 into Van Horn, Texas. This set of signs was replaced by 2009 to use Clearview font. Van Horn was removed on the Exit 138 overhead. Photo taken 01/14/06.